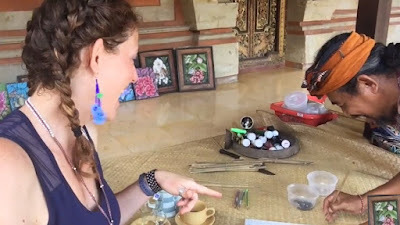 Batuan Village is also famous for its paintings and in the process of using the technique that only developed in the village of Batuan Sukawati Gianyar Regency. Usually the paintings in Batuan Village depict the lives of Balinese people and puppet stories that are thick with magical values. Because the paintings from Batuan Traditional Village were made for Temple decorators. To work on one painting of Batuan it takes months, this is because the process is very complicated to get the beautiful artwork that can be attracted by tourists who come to the village of Batuan. In addition, every painting that is made contains a lot of meanings from ancient times, which give an impression that is so interesting to know. Batuan Balinese art painting itself is famous for being complicated and detailed. The first impression of seeing the paintings Batuan magical charm is extraordinarily thick, especially if the painting is made in black and white and tells of a traditional ceremony with depictions of gods honored by Batuan residents who are mostly devout Hindu Balinese. And you will drift and shudder a little to see meaningful paintings with that particular visualization.